“이십공신회맹축-보사공신녹훈후”는 1694년(숙종 20) 갑술환국으로 재집권한 서인이 1689년(숙종 15) 기사환국에 파훈(罷勳)된 5명의 공신을 복훈(復勳)한 것을 계기로 제작된 것이다. 이 회맹축은 먼저 1680년(숙종 6) 8월에 있었던 보사공신회맹(保社功臣會盟) 시의 회맹문(會盟文)을 쓰고 회맹에 참여한 본공신과 자손의 군호, 공신호, 직함, 성명이 기록된 명단을 싣고 있다. 이어서 신병(身病), 재상(在喪), 발병(廢病), 연유(年幼), 변장재외(邊將在外), 피적(被謫) 등 참여하지 못한 명단을 사유별로 수록하고 ‘康熙十九年 八月日’이라 썼다. 마지막으로 1694년(甲戌) 6월 20일의「復勳時告宗廟祭祝文」에 이어 ‘康熙三十三年十月日’이라는 년기를 적고 좌편에 세필(細筆)로 ‘己巳罷勳甲戌复勳’이라 쓴 후 그 위에 「시명지보(施命之寶)」를 날인(捺印)하였다. 이 “이십공신회맹축”은 왕실이나 충훈부(忠勳府)에서 보관할 목적으로 최고의 재질로 거대하게 제작한 것으로 추정된다. 전문에 걸쳐 한자 한자에 정성들여 쓴 글씨와 선명한 주사란, 고급 재질, 장대한 크기 등 모든 면에서 조선후기 기록문화의 정수를 보여준다 하겠다. 또한 현존하는 완전한 상태의 회맹축이 희소하다는 점에서 높은 가치를 지닌다. This Scroll of the Oath-taking Rites was conducted in 1694, the 20th year of King Sukjong, to commemorate the reinstatement of five meritorious subjects who had been purged amid the factional strife of 1689 surrounding the investiture of the son of Lady Jang as a crown prince. The scroll bears the text of an oath that had previously been taken in 1680 by a group of meritorious subjects and the names and titles of the participating meritorious subjects and their eldest sons and grandsons. Those who were absent are also listed with their respective reasons for absence, classified into disease, mourning, sickness, young age, official duty in border areas or abroad, and exile. This is followed by a memorial message reporting the reinstatement in rites at the royal ancestral shrine, dated "The 10th lunar month of the 33rd year of Kangxi (Qing emperor) ". 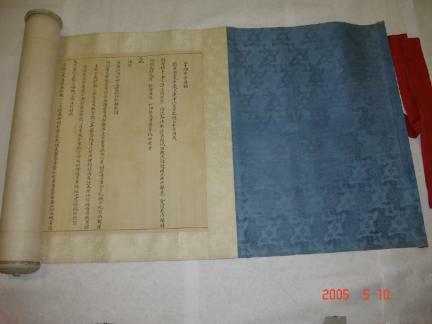 It is assumed the scroll was made in an impressive size with the best materials available for preservation in the royal household or the Office of Merit Subjects. With each letter brushed with great care, it shows the high standard of documentary culture during the latter part of the Joseon Dynasty. It is evaluated even more highly as few documents of this kind are handed down in such perfect condition.